If you are looking for Zong Packages then youwill get its details from this app. It contains information of allZongpackages including 2G, 3G, and 4G below including Price,Volume, Validity, Subscription, and un-subscription. Select yourZong internet packages and enjoy the blazing speed of 3g/4gconnectivity. Zong is offering best packages to its users, eitherit is SMS, call or internet packages. Now don’t remember toughcodes because all it’s done by your app. You can also activate,recharge and deactivate any packages with single click. Everyone knows Zong is the best network for providing the bestcalling and internet quality. Zong provides you the best and clearvoice with the best packages. Zong gives you the affordablepackages which will be best for you. It contains Zong packagesdaily, monthly, 3 days, 7 days and monthly. Company is offeringaffordable Call, Internet &SMS packages to its clients. It provides offline services. Its contains packages of SaudiArabia,Bahrain, India,UAE, Kuwait, India, Afghanistan, UK, USA, Canada,France, Spain, Iraq, Iran, Sri Lanka, Bhutan, Nepal Vietnam,Kashmir, Indonesia and other internationals packages. Note: It is not official application of Zong Pakistan. It is justproviding packages details and user guide. Download andenjoy. If you are looking for Mobilink Packagesthenyou will get its details from this app. It contains informationofall Mobilinkpackages including 2G, 3G, and 4G belowincludingPrice, Volume, Validity, Subscription, andun-subscription. Selectyour Mobilink internet packages and enjoythe blazing speed of3g/4g connectivity. Mobilink is offering bestpackages to itsusers, either it is SMS, call or internet packages.Now don’tremember tough codes because all it’s done by your app.You canalso activate, recharge and deactivate any packages withsingleclick.Everyone knows Mobilink is the best network for providing thebestcalling and internet quality. Mobilink provides you the bestandclear voice with the best packages. Mobilink gives youtheaffordable packages which will be best for you. ItcontainsMobilink packages daily, monthly, 3 days, 7 days andmonthly.Company is offering affordable Call, Internet &SMSpackages toits clients.It provides offline services. Its contains packages ofSaudiArabia,Bahrain, India,UAE, Kuwait, India, Afghanistan, UK,USA, Canada,France, Spain, Iraq, Iran, Sri Lanka, Bhutan, NepalVietnam,Kashmir, Indonesia and other internationals packages.It Include:1. All Mobilink Hourly Call/Data/SMS Packages2. All Mobilink Daily Call/Data/SMS Packages3. All Mobilink 3-Days Call/Data/SMS Packages4. All Mobilink fortnight Call/Data/SMS Packages5. All Mobilink Weekly Call/Data/SMS Packages6. All Mobilink Monthly Call/Data/SMS Packages7. All International Packages detail8. All Mobilink Super Card details9. Sim lagao and other offers10. Important Codes11. Wingle packages12. Easily Card rechargeNote: It is not official application of Mobilink Pakistan. Itisjust providing packages details and user guide. Downloadandenjoy. If you are looking for Zong Packages then youwill get its details from this app. It contains information of allZongpackages including 2G, 3G, and 4G below including Price,Volume, Validity, Subscription, and un-subscription. Select yourZong internet packages and enjoy the blazing speed of 3g/4gconnectivity. Zong is offering best packages to its users, eitherit is SMS, call or internet packages. Now don’t remember toughcodes because all it’s done by your app. You can also activate,recharge and deactivate any packages with single click.Everyone knows Zong is the best network for providing the bestcalling and internet quality. Zong provides you the best and clearvoice with the best packages. Zong gives you the affordablepackages which will be best for you. It contains Zong packagesdaily, monthly, 3 days, 7 days and monthly. Company is offeringaffordable Call, Internet &SMS packages to its clients.It provides offline services. Its contains packages of SaudiArabia,Bahrain, India,UAE, Kuwait, India, Afghanistan, UK, USA, Canada,France, Spain, Iraq, Iran, Sri Lanka, Bhutan, Nepal Vietnam,Kashmir, Indonesia and other internationals packages.It Include:1. 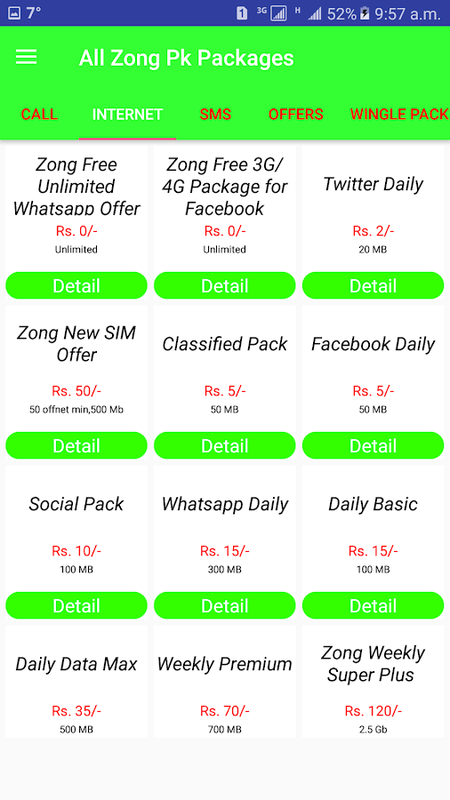 All Zong Hourly Call/Data/SMS Packages2. All Zong Daily Call/Data/SMS Packages3. All Zong 3-Days Call/Data/SMS Packages4. All Zong fortnight Call/Data/SMS Packages5. All Zong Weekly Call/Data/SMS Packages6. 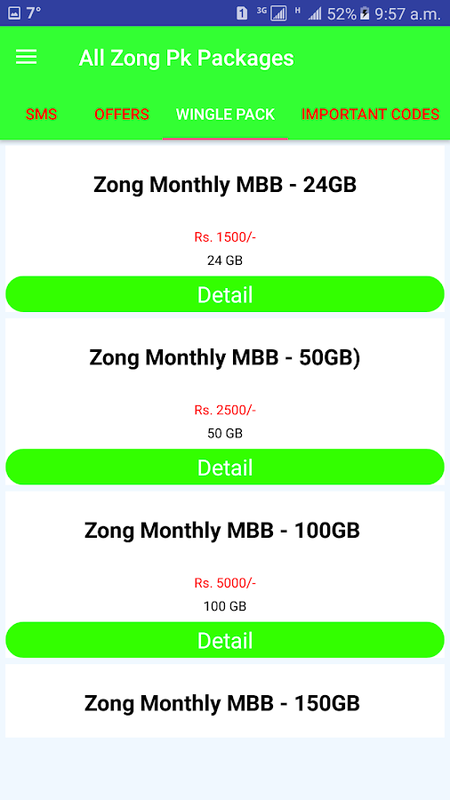 All Zong Monthly Call/Data/SMS Packages7. All International Packages detail8. All Zong Super Card details9. Sim lagao and other offers10. Easily Card recharge11. Wingle packages12. Important CodesNote: It is not official application of Zong Pakistan. It is justproviding packages details and user guide. Download andenjoy. If you are looking for Telenor Talkshawk&Djuice Packages then you will get its details from this app.Itcontains information of all Telenor packages including 2G, 3G,and4G below including Price, Volume, Validity, Subscription,andun-subscription. Select your Telenor internet packages andenjoythe blazing speed of 3g/4g connectivity. Telenor is offeringbestpackages to its users, either it is SMS, call or internetpackages.Now don’t remember tough codes because all it’s done byyour app.You can also activate, recharge and deactivate anypackages withsingle click.Everyone knows Telenor is the best network for providing thebestcalling and internet quality. Telenor provides you the bestandclear voice with the best packages. Telenor gives youtheaffordable packages which will be best for you. It containsTelenorpackages daily, monthly, 3 days, 7 days and monthly. Companyisoffering affordable Call, Internet &SMS packages toitsclients.It provides offline services. Its contains packages ofSaudiArabia,Bahrain, India,UAE, Kuwait, India, Afghanistan, UK,USA, Canada,France, Spain, Iraq, Iran, Sri Lanka, Bhutan, NepalVietnam,Kashmir, Indonesia and other internationals packages.It Include:1. All Telenor Hourly Call/Data/SMS Packages2. All Telenor Daily Call/Data/SMS Packages3. All Telenor 3-Days Call/Data/SMS Packages4. All Telenor fortnight Call/Data/SMS Packages5. All Telenor Weekly Call/Data/SMS Packages6. All Telenor Monthly Call/Data/SMS Packages7. All International Packages detail8. All Telenor Super Card details9. Sim lagao and other offers10. Easily Card recharge11. Wingle Packages12. Important CodesNote: It is not official application of Telenor Pakistan. It isjustproviding packages details and user guide. Download andenjoy. Mobilink Pakistan app provide all Packages information’s containingSms, Call, Internet 3G,4G and international offers and other offerslike Sim lagao offer. User can easily find the information aboutall types of Jazz offers. It also provide remaining sms, minutes,internet , account balance. You can recharge card by just oneclick. Someone can subscribe all packages by just clicking thedesire package. 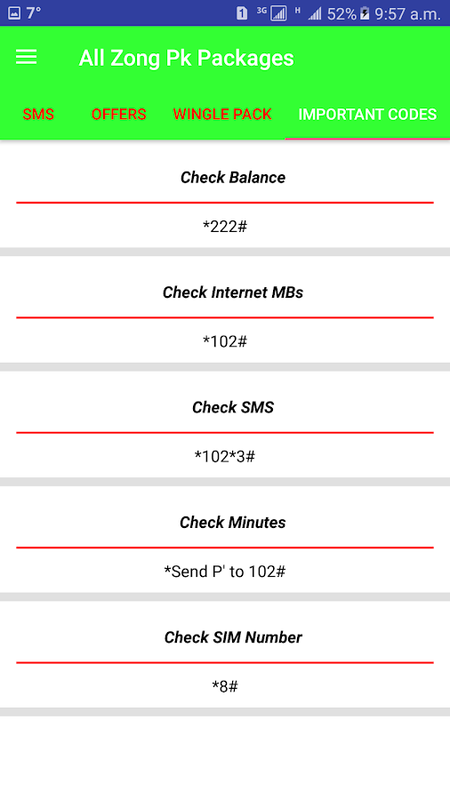 Mobilink (Jazz) Packages 2019 free and Updated. AllJazz sim packages and bundles are updated regularly.It Contains Alldetail , price, validity and codes of Packages. You can findfollowing Mobilink and Warid packages and offers information inthis app: • Sim Lagao Offers • Internationals Offers •Jazz/Mobilink 3G Packages • Jazz/Mobilink 4G Packages • MobilinkInternet Packages and net offers • Mobilink/Jazz SMS Packages •Mobilnk/Jazz Call Packages and bundles • Now, you don't need toremember tough and complicated packages subscription codes andtheir details.You have to install Mobilink app once, and you willhave information about all latest packages in your hand without anyadditional Internet connection. These packages consist of Hourly,Daily,weekly,monthly and yearly offers, also consist of otherprepaid offers and postpaid offers. Free Packages that are offeredby Mobilink/Jazz are also available in the app according toMobilink policy. Download and enjoy. All Zong Pakistan app provide all Packages information’s containingSms, Call, Internet 3G,4G and international offers and other offerslike Sim lagao offer. User can easily find the information aboutall types of Zong offers. It also provide remaining sms, minutes,internet , account balance. You can recharge card by just oneclick. Someone can subscribe all packages by just clicking thedesire package. 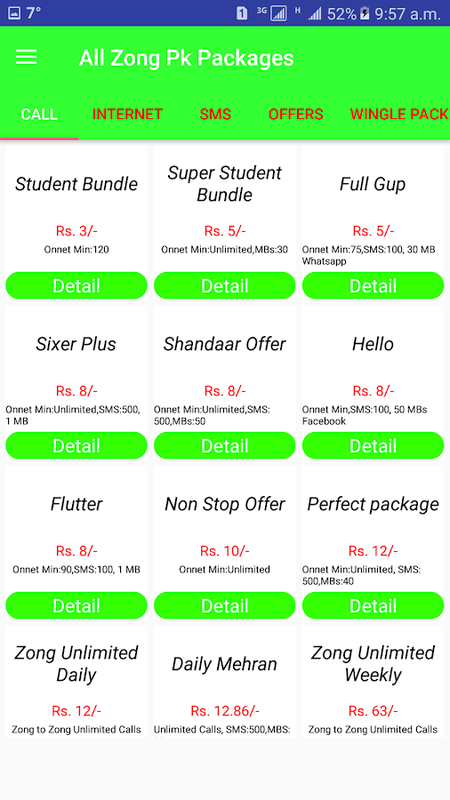 Ufone Packages 2019 are free and Updated. All Zongpackages and bundles are updated regularly.It Contains All detail ,price, validity and codes of Packages. Free packages Free FacebookFree whatsapp You can find following Zong packages and offersinformation in this app: • Sim Lagao Offers • Internationals Offers• All Zong 3G Packages • All Zong 4G Packages • All Zong InternetPackages and net offers • All Zong SMS Packages • All Zong CallPackages and bundles All Zong Offers: Combo Pack New Offers AllZong Super Card Supreme Offer Supreme Plus Offer All-in-1 WeeklyShandaar Daily Offer Shandaar Haftawaar Offer Shandaar Mahana OfferStudent Bundle Super Student Bundle Hello Offer Daily SMS +WhatsApp Bundle Zulu SMS Bundle Weekly SMS Bundle Daily FacebookSocial Pack Super Weekly Max Good Night Offer Daytime Offer DataShare Bundle 5GB Data Share Bundle 10GB Daily Basic Daily Data MaxSuper Weekly Monthly Mini 150 Monthly Premium 12GB Monthly 36GBMonthly 75GB 3 Months Packages 6 Month Packages 12 Months PackagesNow, you don't need to remember tough and complicated packagessubscription codes and their details.You have to install All Zongpackages free app once, and you will have information about alllatest packages in your hand without any additional Internetconnection. These packages consist of Hourly, Daily,weekly,monthlyand yearly offers, also consist of other prepaid offers andpostpaid offers. Free Packages that are offered by Zong are alsoavailable in the app according to Zong policy. It Provide Servicesoffline. Its contains Sudia Arabia, Bahrain,India,UAE, Afghanistan,UK,USA,Canada,France, Spain,Iraq,Iran and other InternationalsPackages. Download and enjoy and Sab Kah Do. All Ufone Pakistan app provide all Packages information’scontaining Sms, Call, Internet 3G,4G and international offers andother offers like Sim lagao offer. User can easily find theinformation about all types of Ufone offers. It also provideremaining sms, minutes, internet , account balance. You canrecharge card by just one click. Someone can subscribe all packagesby just clicking the desire package. Ufone Packages 2019 are freeand Updated. All Ufone packages and bundles are updatedregularly.It Contains All detail , price, validity and codes ofPackages. Free Packages Free whatsapp Free facebook You can findfollowing Ufone packages and offers information in this app: • SimLagao Offers • Internationals Offers • Ufone 3G Packages • Ufone 4GPackages • Ufone Internet Packages and net offers • Ufone SMSPackages • Ufone Call Packages and bundles All Ufone Offers: PowerHour Asli Chappar Phaar Offer Daily Pakistan Offer Beyhisaab OfferSuper Minutes New offers Super Recharge Offer Mini Super Card SuperCard Super Card Plus Super Load Daily Package DAILY CHATInternational SMS Bucket Unlimited Package Yearly SMS PackageWeekly SMS Bucket 45 Day SMS Bucket 2-in-1 SMS Offer Unlimited SMSBucket SPECIAL DAILY DAILY LIGHT MEGA INTERNET SOCIAL DAILY 3 DAYBUCKET WEEKLY LIGHT SUPER INTERNET WEEKLY INTERNET PLUS MONTHLYLIGHT MONTHLY HEAVY SOCIAL MONTHLY Now, you don't need to remembertough and complicated packages subscription codes and theirdetails.You have to install All Ufone packages free app once, andyou will have information about all latest packages in your handwithout any additional Internet connection. These packages consistof Hourly, Daily,weekly,monthly and yearly offers, also consist ofother prepaid offers and postpaid offers. Free Packages that areoffered by Ufone are also available in the app according to Ufonepolicy. It Provide Services offline. Its contains Sudia Arabia,Bahrain,India,UAE, Afghanistan, UK,USA,Canada,France,Spain,Iraq,Iran and other Internationals Packages. Download andenjoy and Say Tum he to Ho.